For the mentally ill and emotionally troubled, encounters with law enforcement officers and incarceration in jails pose a risk of death. A spike in fatalities in Oklahoma jails this year and several confrontations between police and the mentally ill since 2014 have raised questions about whether officers and jailers are sufficiently trained to deal with people with mental health problems. Training data indicates it is a special concern in rural areas. During 2015, at least seven of the 25 fatal police shootings in Oklahoma, or 22 percent, involved people who exhibited signs of mental illness, according to a Washington Post database of police shootings. So far this year, the rate is 32 percent, or seven of 22. In Oklahoma jails, the number of suicides through October this year is higher than it has been in each of the last eight complete years, driven by a rise in suicides in the Oklahoma County Jail and in rural county and police jails. Several incidents have raised the issue of whether officers and jailers are trained well enough to deal with the behavior of mentally ill people. • In Wagoner County in August 2014, police shot a schizophrenic man who was in a state of psychosis during a short standoff in which the man, Gary Clark, who was holding a kitchen knife, remained on his porch and did not come off it until shot with pepper balls. The City of Broken Arrow, but not the county, agreed to pay the man’s medical expenses and review its policies for dealing with the mentally ill.
• In Ardmore in August 2015, an officer fatally shot an unarmed suicidal man outside his home after, according to officers, he refused to remove his hands from his pockets. The mother of the man had called police after being told by mental health workers that it was the only way he could be admitted to the crisis center. The officers involved were cleared of wrongdoing. • In McCurtain County in February 2015, a schizophrenic man died in the county jail after being shocked several times with a Taser. The man, who had just returned from a visit to a psychiatrist and had a history of being jailed for mental health issues, had refused to put jail clothes on and jailers tried to force him to do so. A video obtained by Oklahoma Watch shows jailers escorting the prisoner into a shower room to change, an ensuing struggle inside the room, and the prisoner’s naked, limp body being hauled out of the room by jailers. The number of homicides and suicides in Oklahoma jails has increased this year, with a total of 31 through October. The Oklahoma County Jail has led the trend, with seven homicides or deaths of undetermined cause and five suicides. Michael Brose, who heads Mental Health Association Oklahoma, did not comment on these specific cases or others. But he said dealing with a mentally ill person who is experiencing a psychotic episode is much different than dealing with others and requires different strategies and tactics, Brose said. “If someone is in a psychotic state and delusional and paranoid as a part of the symptoms of serious untreated mental illness, that ‘command voice’ could escalate the situation rather than deescalate it,” Brose said. “That’s a complete 180 from what they learn about command voice in the academy. “The response by law enforcement can turn something from a crisis and volatile situation, into someone getting help,” Brose said. Both law enforcement officers and mental-health experts say there is a need for higher levels of training in mental health to avoid or defuse situations that could lead to the death or injury of suspects or officers. Toggle between slides by clicking or tapping arrows or bars. Under state law, new law enforcement officers are required to undergo at least four hours of initial mental health training from the Council on Law Enforcement Education and Training. They also must take two hours of in-service training each following year. However, that training covers a lot of ground in a short time, including crime and drug prevention and youth and family intervention techniques. It is not required to include crisis intervention, although some classes, such as hostage negotiation, relate to intervention, according to the education and training council. Unlike with officers, the state does not require jailers to undergo any form of mental health training, although some jails do so anyway. Yet despite the required training, Oklahoma State Department of Health rules require that jailers screen prisoners for signs of mental health issues or whether the inmate is suicidal. Larger law enforcement agencies and jail operations, such as those in Oklahoma City and Tulsa, have implemented intensive training for some officers. Small rural agencies and county jails often lack the resources and manpower to provide similar mental-health training for their officers and staffs. And sometimes, there is resistance by rural law enforcement to do the training. “It depends on the jurisdiction leadership and a lot of other different factors,” Brose said. “I’m always a little hesitant to be hard on law enforcement. It’s incumbent upon us (the mental health field) to provide that training. It’s also incumbent for them, law enforcement, to step up and say they don’t know it all. “That blue line is a real deal, and it takes strategy to get on the other side of that blue line,” Brose added. Law enforcement officers gather at the Tri County Technology Center in Bartlesville in mid-November for training on crisis intervention involving mentally ill people. One by one, more than a dozen officers at the Tri County Technology Center in Bartlesville put on the headphones given to them by trainers. Then the voices in the headphones started. Some voices were loud and yelled warnings. Others were soft. Some sounds were not voices at all. Then, with the voices in their ears, the officers were asked to perform several tasks. The experience was intended to give officers an understanding of how difficult it is to function when the symptoms of mental illness are present, said Sgt. Corey Nooner, a trainer for the Oklahoma City Police Department’s crisis intervention team. In this case, the simulated illness was schizophrenia. The exercise was one of dozens that the law enforcement officers were required to take as part of their crisis intervention training in mid-November. It was provided by the Oklahoma Department of Mental Health and Substance Abuse Services through a federal grant. The 40-hour, weeklong training covers topics such as how to determine whether a person meets the criteria for civil commitment, ways to de-escalate situations involving people in a mental health crisis, and how to spot warning signs of potentially suicidal individuals. 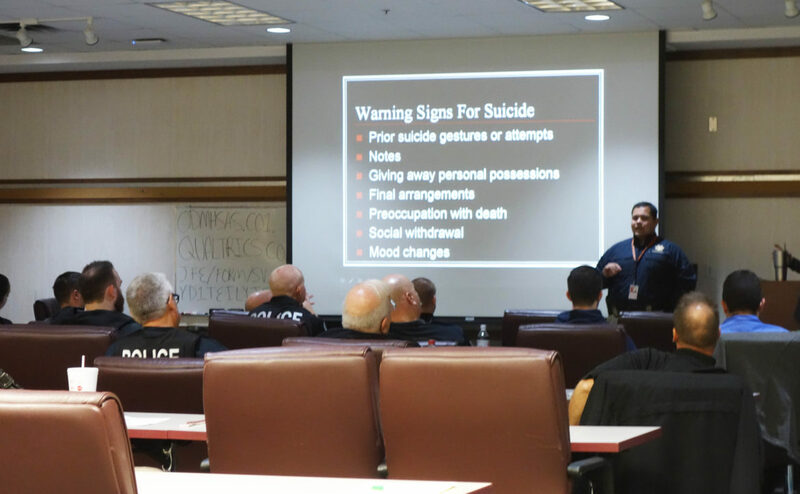 Mental health and law enforcement experts have touted such training as being essential because it helps officers deal more effectively with the mentally ill and know how to de-escalate situations that endanger both citizens and officers. Often, how a CIT-trained officer responds to someone in a psychotic episode can be the exact opposite of how officers are taught in basic law enforcement training, such as the use of a loud, clear “command voice,” Brose said. Since crisis intervention training began in Oklahoma in 2002, more than 1,200 individuals from 124 different agencies have participated, said Tania Woods, law enforcement liaison with the Oklahoma Department of Mental Health and Substance Abuse Services. Those include city police departments, sheriff’s offices, school police forces, hospital security and some courts. Although many CIT-trained officers are in rural areas, it is often much more difficult for rural agencies to send their officers to training for a full week or to break through resistance to the training encountered in some rural areas, said Traci Cook, president of NAMI Oklahoma. The federal grant that helps fund CIT training also reimburses rural law enforcement $400 for each officer who attends the training, but that is sometimes not enough of an incentive, Danley said. He and others said they think it should be part of basic police training. CLEET mental health courses cover various situations, but they are far less detailed than CIT training, said Charles Gerhart, assistant director for CLEET. However, the yearly mental health training requirements for police in Oklahoma puts the state far ahead of others that do not require them, Gerhart said. “There’s not often a large component (in other states), where every year you have two hours of mental health,” Gerhart said, adding that cuts in funding make it difficult to provide new training programs. Those funding issues are likely causing law enforcement officers to increasing encounter people in mental health crisis, DMH’s Woods said. That is driving more agencies to seek CIT training, she said.